Usually people shake hands with the teacher, assess her behavior, her interaction with the kids, her welcome speech, her bulletin board, and her room layout. Usually. And yes. This is something that I did carefully when I went to the little “Open House” for my son’s preschool. The inquisitive journalist in me asked multiple questions. Multiple. She probably thought I was Barbara Walters, but hey … this was my kid. I wanted to get the whole vibe on the room, the kids and the teachers. I used to substitute teach for a couple of years. I know teachers, well at least the middle-school kind. So I just wanted to be sure my kid would be all right. Sure enough he was … both teachers seemed to pass The Guat’s test. But as we finished the formal talking bit we moved over to the ice cream social part of the evening and this … this is where it happened. As I was checking out all the kids, making sure the crazies, if any, were nowhere near my son, I began looking at the parents. Something wasn’t quite right. The kids seemed to be fine, normal four-year olds, some in desperate need of a time-out, but nevertheless pretty normal. But the parents … the parents seemed a little too Children of the Corn for me. All of them with that same creepy blank stare. Standing there by the slides and sandbox with their suits and flowery dresses. One couple tried to talk to me about something and I just made my way toward the monkey bars. I have no room for new friends, especially the Children of the Corn type. Can I tell you how much that movie creeped me out? Middle-school, dragged out to the Million Dollar theater by my sister. Dude. I don’t think I’ve seen a scary movie ever since. I haven’t even seen The Exorcist. I’m not a big fan of that, but I do watch stuff like Law & Order, and CSI stuff. I guess I’m more into crime solving, suspense type of dramas and less into the creepy horror thing. However this whole Stephen King vibe that the parents were giving out sort of gave me second thoughts about letting my kid hang out with these people’s kids twice a week. And then as I kept scanning the crowd I noticed a couple looking at everyone the same way I was looking at everyone. Then another. And another. 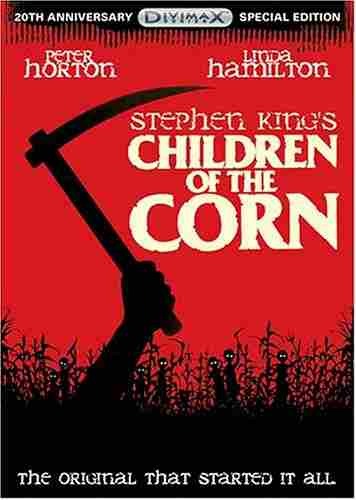 Apparently there was an entire group of us having second thoughts until we realized that the Children of the Corn group was smaller than we thought. But still … I don’t think I’m going to be doing any bonding with these parents. I know the kids are all right, but you never know, parents seem to have some sort of influence. Yeah … we might even change schools. Ugh! This one was so not cool. They’re having a celebrate Fall BBQ. I’m totally thinking of excuses right now. I can’t help but smile. Just a few years ago, I was in the same boat as you. My 4 year old is entering mother’s day out before formal pre-K. Same thing, the kids are as normal as any 4 year old and the teacher just as lovable but the parents were something else. Some are friendly up front, others paranoid while several have this social group thing and only talk to each other. I thought for awhile they were racist…pardon my words but that was how they acted. They actually smile at me…the moms I mean but my wife told me one day, “I try to smile and be friendly but they are acting snobbish.” I told her, “don’t worry, its their loss.” Honestly I felt sad that despite of equality and all, there are still people who are close minded…and yes, like children of the corn parents. Great post.